The idiom “you’ve got rocks in your head” means that you are stupid. What if I told you that you really do have rocks in your head and so do I. In fact we all have rocks in our head. Really. You’ve probably heard of or even had kidneystones or gallstones, but rocks in our head? One of the benefits of teaching histology in medical school is that you learn all sorts of interesting things including about rocks in our heads. 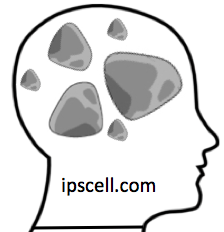 One type of rocks in our heads are otoliths, which literally means “ear rocks”. Otoliths reside in our inner ear. They are part of our sensory apparatus that helps us sense movement and gravity via the force exerted on these rocks. Imagine that we have gravity sensors and they are rocks in our heads! You can learn more here. Because of their high calcium carbonate composition, otoliths are often the main fossilized remains of animals including fish and belong to a class called “micro-fossils”. Cool, huh? Another type of rocks in our head consist of brain sand or Corpora arenacea. Brain sand is most commonly found in our pineal gland, but can also accumulate in other parts of the brain to a lesser extent. According to Wikipedia, brain sand is made of various minerals include calcite, calcium phosphate, calcium carbonate, magnesium phosphate, and ammonium phosphate. Interestingly, as these rocks accumulate in our heads as we age such that by middle age they make our pineal glands show up clearly on some types of brain imaging. Unlike otoliths, the functions if any of brain sand remain unknown. Darn. If I’m going to have rocks in my head I’d like to know what they are doing there. Some folks think that crystals have magical powers so the notion that we have crystals in our brains might lead some to think they give us supernatural abilities. This idea is amplified by the thought by some that the pineal gland, home to brain sand, gives us psychic powers. Science and medicine tell us that the pineal gland regulates sleep and body rhythms in part via melatonin production. It’s interesting to think about the fact that we have these rocks in our heads. I hope that someday we will know why the brain sand is there.